Mexican tile mix made of 100 ceramic tiles 4x4 inch is the best and most often purchased set of designs. All twenty designs are multicolored with complicated patterns. 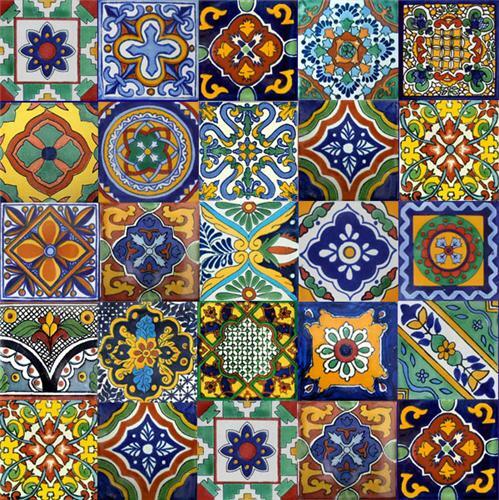 Even though Mexican hacienda tile is clearly influenced by Spanish heritage, they are more colorful than the original motifs introduced to Mexico a few centuries ago. Wonderful, they are just wonderful, quality is excellent, solid and bright colors, these tiles help to create a completely different atmosphere, they came in 5 weeks, perfect and carefully packaged. We received this set of tile in about 6 weeks. Not bed for delivery from Mexico to EU. Good packing, no tile broken. They included a few extra pieces, thank you. Great looking tile lot consisting of twenty different Mexican tile patterns. Once we installed them on our kitchen backsplash they began crazing. Since our house has a rustic décor the tiles with vintage look added to the rustic décor overall. I like the mix of mexican tile patterns in this lot. They are very decorative con variety of colors. Great stuff for wall backspalsh and counter in our new kitchen. I like this Mexican tile mix a lot. It doesn't include any solid color tiles but beautiful colonial style patterns.